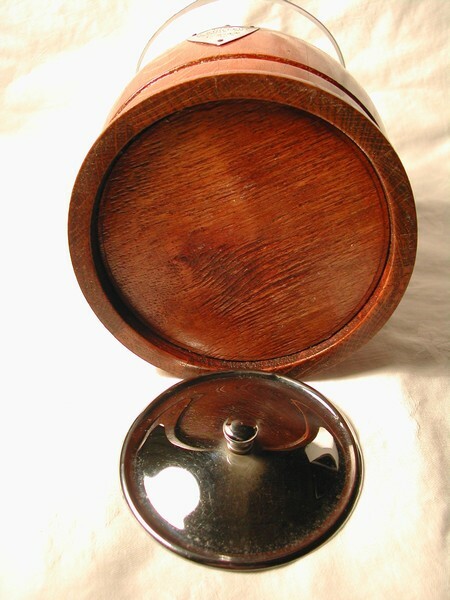 This is a wonderful vintage oak and chrome biscuit barrel that was imported from England. It has a rich golden-brown finish; the top rim, lid, handle and the cartouche are made of chrome. The liner inside is made of porcelain. These types of barrels were given as awards (trophies, as Americans call them). This one has engraving which reads: 1955/D. Stollery/Fastest “25”/1-3-44. This one is in great condition; just some scratching to the lid and handle (see pictures) but everything else is fine. The dimensions are: 6” H (without the finial and handle) and 5 1/2” W (bottom rim) You could use this barrel to put small cookies, candies, paper clips etc… This lovely oak barrel would look great in any room that you would like to add a little vintage English charm.